Today, I'm going to give a big ol' thumbs-up to the Pelonis 18-Inch 3-Speed Oscillating Stand Fan. We picked up ours at Lowe's for $35. I mentioned that we recently finished a room in our house, and it happens to be the one part of the house that isn't air conditioned. It's on the lower level, so it naturally stays quite cool, but that still isn't enough for me (because of my hypohidrosis). It's fine on most days, however, with the addition of a fan. Our old stand fan got broken during the move a few years back, so we had to get a new one. This one has been really good so far, after using it regularly for the past couple of weeks. It was easy to assemble, and it's light enough to carry around. (Hence the picture of it in our living room, where it is currently.) It also came with a wee remote, which I haven't had need to use yet, but it's a nice extra feature! 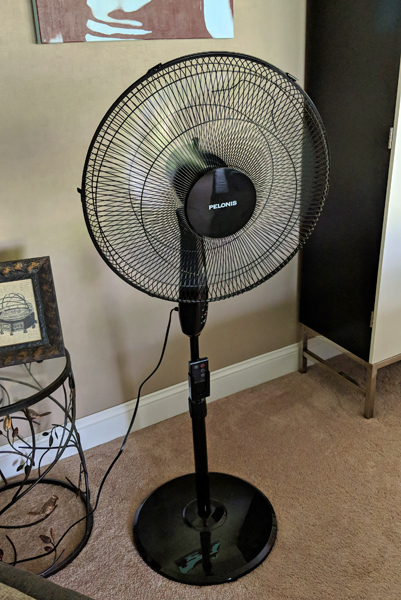 I figured between the heatwaves across the country, the traveling smoke from wildfires out west, and the flooding on the east coast, lots of folks might be in the market for fans at the moment, so I'd go ahead and mention how much I like this one.